The webmaster on this system is T.S. Kelso (the T.S. stands for Thomas Sean, but I prefer T.S.). I am currently a Senior Research Astrodynamicist for Analytical Graphics, Inc.'s (AGI's) Center for Space Standards and Innovation (CSSI) located in Colorado Springs, Colorado. AGI provides commercial off-the-shelf analysis and visualization solutions to more than 30,000 aerospace, defense, and intelligence professionals via the Systems Tool Kit (STK) software suite. I also serve as the operations manager for the Space Data Center (SDC). The SDC screens over 750 satellites daily in LEO, MEO, and GEO for close approaches with other satellites and the many thousands of pieces of debris currently being tracked by the US Space Surveillance Network. My academic background includes a BS from the US Air Force Academy in both Physics and Mathematics (1976), an MBA in Quantitative Methods from the University of Missouri-Columbia (1979), an MS in Space Operations from the Air Force Institute of Technology (1982), and a PhD in Mechanical Engineering (Operations Research) from The University of Texas at Austin (1988). My master's thesis was titled An Investigation of Spin-Orbit Resonance Effects About the Geosynchronous Orbit. My PhD dissertation was titled Temporal Clustering in the Multi-Target Tracking Environment. My job experience began with a four-year tour working with the Minuteman II ICBM at Whiteman AFB, Missouri. I pulled 174 alert tours as a Missile Combat Crew Commander where I was primarily responsible for maintaining the alert status of ten missiles. Most of my alerts were at the Wing Alternate Command Post where I was responsible for the entire wing of 150 missiles. After working as a wing instructor for six months, I was picked to teach Minuteman II ICBM Operations at the Combat Crew Training Squadron at Vandenberg AFB in California where about half of the US launches are conducted. Here I had the opportunity to watch many launches (Minuteman, Titan III, Atlas, etc.) and work with many of the space activities on base. In 1982, as I was completing my MS in Space Operations, I was selected as an alternate for the US Air Force Manned Spaceflight Engineer Program (there were eight primaries and eight alternates out of 2,000+ applicants) which would have permitted me to work as the military equivalent of a payload specialist on DoD space shuttle missions. While I was disappointed in not being selected as a primary, the Challenger disaster killed this program off before any of the primaries ever got to fly. In 1983, I began work as the Chief, Training Plans Branch for the activation of the Consolidated Space Operations Center which now operates outside of Colorado Springs. I was responsible for developing all of the training plans needed to transition operations from contractors at the Satellite Test Center in Sunnyvale, California (now Onizuka AFB) to "blue-suit" operations at Falcon (now Schriever) AFB, Colorado. My last job before going to get my PhD was as Chief, Spacecraft Operations Team for the Global Positioning System (GPS). I headed a team of 40+ contractors, several US Air Force officers, and a number of contractor groups in maintaining the day-to-day operation of a constellation of nine Block I GPS satellites. I also successfully conducted two GPS launches and planned for the deployment of the Block II satellites from the US space shuttle (a plan which was later canned due to the Challenger disaster). I also worked with both the Vela and Defense Support Program satellites within our Mission Control Complex. 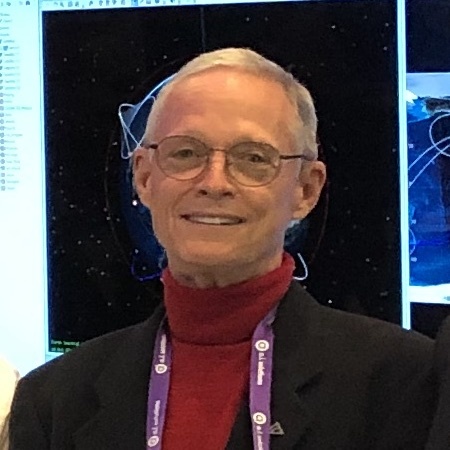 After completing my PhD in 1988, I worked as an Assistant Professor of Space Operations (1988-1994) and the Director of the Graduate Space Operations Program (1990-1993) at the Air Force Institute of Technology at Wright-Patterson AFB in Ohio. My primary job was to teach subjects related to space operations within the US Department of Defense. I taught courses on Space Operations Planning (spacecraft design and systems analysis), Introduction to Space Programs and Operations (space history, law, policy, strategy, etc. ), Space Systems Simulation, and an occasional course on Operations Research. Besides administering a graduate program (which awards a Master of Science in Space Operations) for 35+ students from the US Air Force, US Army, US Navy, and both the Canadian and Australian military services, most of my time was taken up conducting research or consulting to the military and universities. My primary area of expertise is in the area of orbital mechanics. While at AFIT, I worked as a thesis advisor on dozens of theses ranging from developing spatial registration techniques for use with polar-orbiting weather satellites, to computer-modeling of various types of lasers, to attempting to determine the cause(s) of and test a treatment for space adaptation syndrome, to developing computer simulations to study current and future space systems. I consulted with the Pakistani Space Agency (SUPARCO) on satellite tracking models and software, the Massachusetts Institute of Technology to provide improved orbital models/software in support of their research with the Hubble Space Telescope, and with the Yokohama Science Center in Japan to provide information on satellite tracking and orbital elements. I worked with the Lick Observatory on developing a means of using geosynchronous satellites to calibrate the telescope pointing mechanisms of the telescopes supervised by the University of California, a procedure applied in the activation of the Keck 10-meter telescope in Hawaii, the largest telescope in the world. I also worked with the National Solar Observatory (under the National Oceanographic and Atmospheric Administration (NOAA)) to set up the first system to capture and display weather data from polar-orbiting satellites at the South Pole. Initial results were quite promising and the system is now conducting year-round operation. I worked with NASA researchers at Goddard Space Flight Center to prepare the Shuttle Solar Backscatter Ultraviolet (SSBUV) experiment for STS-34 and with Mission Specialist Ron Parise to prepare the Shuttle Amateur Radio Experiment (SAREX) used on STS-35. I have also been fortunate to be able to visit many of the launch and space support facilities of the world, including those at the Kennedy and Johnson Space Centers, NORAD/Cheyenne Mountain, Vandenberg AFB, Cape Canaveral AFS/Patrick AFB, and the Baikonur Cosmodrome in Kazakhstan. During these visits, I've had opportunities to operate the various Space Shuttle simulators, to watch processing in the Orbiter Processing Facility at KSC, watch the first Space Shuttle landing at Edwards AFB, and see Apollo, Space Shuttle, and Soyuz manned launches. I've even had the opportunity to visit White Sands Missile Range to watch the first public launch of the Delta Clipper (DC-X). Before leaving AFIT, I served as Deputy Chief of the SPACECAST 2020 Technology Team (1993 to 1994). This project, chartered by then US Air Force Chief of Staff, Gen McPeak, looked at concepts and technologies required for the USAF to perform its mission in the 2020-2050 time period. My duties were to assess potential technologies being considered. I was given the additional responsibility of developing a sub-study on unconventional means for launching into Earth orbit. Results of this study can be found on the Air University WWW site. During my next assignment, while assigned at Maxwell AFB in Alabama, I served as the Deputy Director of the Air University Research Coordinator Office and later as the Associate Director for Research in the College of Aerospace Doctrine, Research, and Education. I was responsible for developing and maintaining the Air University WWW home page, supporting Air Force Chief of Staff Gen Fogleman's Air Force 2025 future study, and supporting the research programs of all Air University schools. I also worked as the Director of Plans and Programs for the Research Department in the Air Command and Staff College. During this time, I was also the AIAA General Co-Chair for the AAS/AIAA Spaceflight Mechanics Conference in Huntsville, Alabama on 1997 February 10-12. Following my assignment at Air University, I again returned to the Air Force Institute of Technology, this time as Associate Dean of the Graduate School of Engineering. Within a year, I was selected as Vice Commandant of AFIT and eventually served briefly as Commandant in 2001. In those last two positions, I was responsible for one graduate school and two continuing education schools with 450 faculty and staff, a 500,000 square foot campus, and an annual budget of $80 million. I also served as an Assistant Professor of Space Operations in the Department of Operational Sciences. In 2001, I was selected as the first Director of the Air Force Space Command (AFSPC) Space Analysis Center (ASAC) at Peterson AFB in Colorado. I was responsible for all technical analysis (including orbital analysis) supporting current operations and future systems acquisition for AFSPC. During this tour, I was AFSPC's analysis lead for Task Force Enduring Look, where I led the effort to analytically quantify the contributions of space systems to Operations ENDURING FREEDOM and NOBLE EAGLE. In 2003, I led all Department of Defense analysis centers supporting the Columbia accident investigation. In that investigation, the ASAC discovered the Flight Day 2 piece and analyzed its ballistic and radar characteristics to help NASA determine its origin. This was a crucial part of the overall investigation. I also served as part of NASA's Near-Earth Object Science Definition Team which produced the report titled Study to Determine the Feasibility of Extending the Search for Near-Earth Objects to Smaller Limiting Diameters. I retired from the US Air Force on 2003 December 17the 100th anniversary of flightin the rank of colonel with over 31 years of active duty service time. As part of my duties at CSSI, I run the CelesTrak web site. I am also a Fellow of the American Astronautical Society (AAS), an Associate Fellow of the American Institute of Aeronautics and Astronautics (AIAA), and an adjunct professor at the Air Force Institute of Technology.